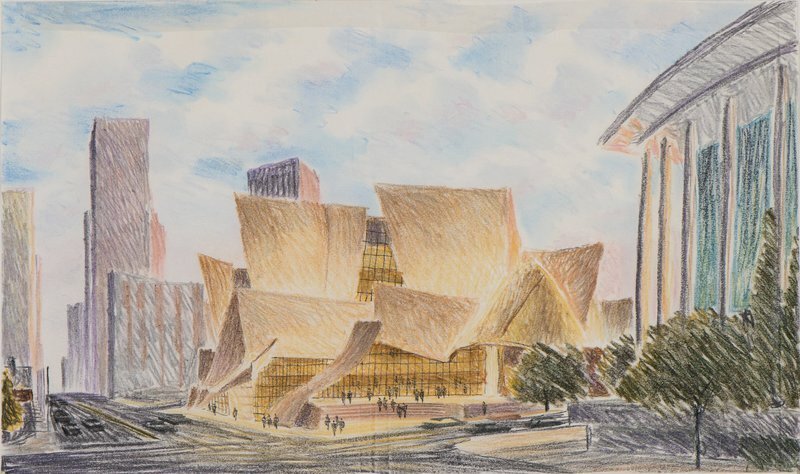 A Diniz illustration of Walt Disney Concert Hall, Los Angeles. Frank O. Gehry Associates, architects. Walt Disney Concert Hall in Los Angeles. Boston’s Fanuiel Hall. Union Station in Washington D.C. The World Trade Center. These landmark, iconic developments have something in common: Long before they were constructed, they came to life through art by famed architectural illustrator Carlos Diniz. Described as the “last great architectural illustrator to work in the techniques and materials of the hand-drawn perspective,” Diniz touched thousands of projects around the world, for some of the world’s best architects, across his four-decade career. 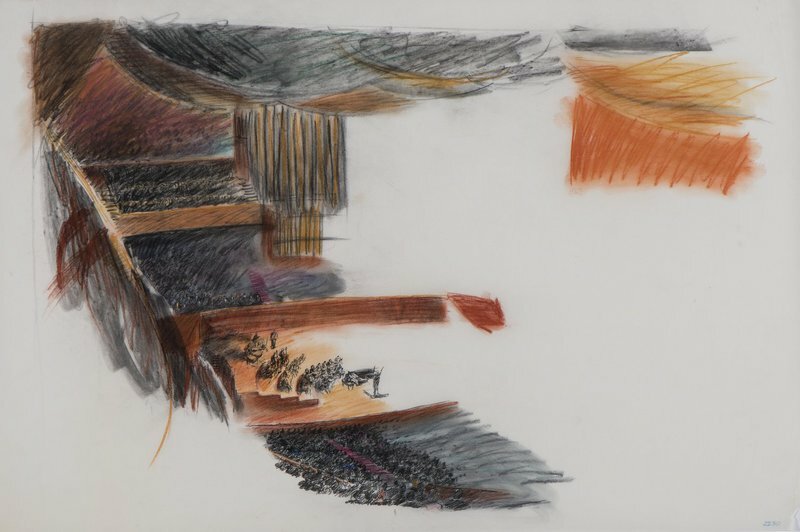 Thanks to a gift from his family, the vast archive of work by Diniz, who died in 2001, is now part of the permanent collection of UC Santa Barbara’s Art, Design & Architecture Museum. A small exhibition offering a peek into Diniz’s diverse portfolio — and into his artistic process — is showing on campus through Aug. 14. The museum is open Wednesday through Sunday, from noon to 5 p.m. Admission is free. Born in Arizona in 1928, Diniz was raised in Los Angeles. After two years in the Army, he returned to Southern California and earned a degree from Art Center College of Design. He worked five years for noted Vienna-born architect Victor Gruen before establishing his independent studio, Carlos Diniz Associates, in 1957. His firm earned acclaim for its incorporation of unique techniques, including serigraph and aerial photography, in its illustrations. Diniz and his team also employed what came to be known as “storytelling” illustrations that situated a project in its intended location and, through detailed drawings, placed viewers in a project. Said Gibbs, “Diniz was important for several reasons: His great skill as a renderer and draftsman; his knowledge and interest in modernism; and the fact that he established his office at the right time, when large urban projects were being built in Los Angeles and other cities. “This archive opens the work of a great architectural illustrator to researchers and the public, and brings into the museum’s own archive the work of major architectural firms from around the world,” she continued. “The Diniz archive deepens our collection of works by architects in Southern California, which is our major focus, and includes work by Southern California firms done in other cities. It also includes the designs of international architects who worked all over the world. The newly received archive documents some 2,000 projects that Diniz touched — individual buildings, large commercial developments, master plans and more — designed by architects, planners and developers in California, North America, Europe, East Asia, Mexico and the Middle East. Diniz’s roster of heavy-hitting clients included Victor Gruen, the Rouse Company, George Nelson, Frank Gehry, Barton Myers, Welton Becket, Minoru Yamasaki, Richard Leggoretta, Cesar Pelli and many others.